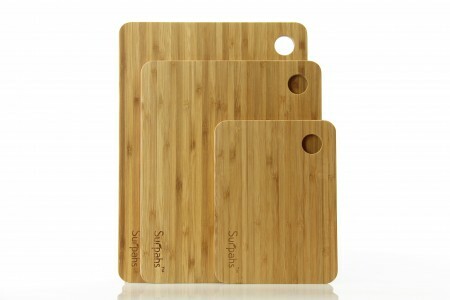 Only 0.4 inches (10 mm) thinner, lighter and sleek design, durable for any kitchen prep. Knife-friendly surface helps protect blade integrity. Natural beautiful finish, FDA certificated, 100% satisfaction guaranteed. Set of 3 cutting boards in small, medium and large sizes, perfect kitchen accessories for cheese, bread, meat and vegetable cutting. Do not place in dishwasher. Always wash with hot soapy water, then rinse and dry between each use. To protect the life of your bamboo products, apply mineral or vegetable oil to surface after each use.